This year's Supreme Court IP Review (SCIPR), held on September 12, was the largest in the conference's history. More than 20 attorneys and law professors from around the country, including counsel from all 10 intellectual property cases decided by the Supreme Court last Term, shared their analysis of the Supreme Court's past and upcoming Terms at an all-day conference. David J. Kappos, former undersecretary for commerce and former director of the U.S. Patent and Trademark Office (pictured at right), delivered the keynote address on "Stalemate or Statesmen? What Is Needed to Move Forward Constructively with the Balancing of America's IP System." Quoting the Rolling Stones, Kappos advised the packed audience about patent reform: "'You can't always get what you want. But if you try, sometimes, well, you might find, you get what you need.' And it is true today in patent litigation reform that while no constituency will get all of what it wants, it is possible we can all get what we need." Kappos outlined a seven-point plan to achieve reforms and balance in patent law, including demand letters by patentees, discovery and pleadings, safe harbors for mere retailers and innkeepers, codification of the Supreme Court's indefiniteness standard, and a bar against fee diversion from the Patent Office. 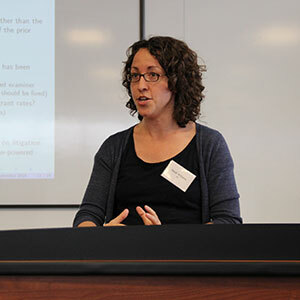 The keynote address will be published as part of a symposium in the Chicago-Kent Journal of Intellectual Property. In response to an audience question, Kappos also credited the empirical research of Professor David Schwartz that debunked the view that the United States recently had an "explosion" in lawsuits filed by so-called patent trolls. Kappos said that Schwartz's research (with Professors Chris Cotropia and Jay Kesan) helped to provide a turning point in the debate over patent reform bills in Congress by injecting solid empirical research in place of hysteria. Professor Edward Lee and Professor Schwartz also launched a new empirical program at this year's SCIPR. Lee and Schwartz analyzed data from the Supreme Court's past Term, including the reversal rate, unanimity and voting alignments among the Justices, the correlation between the number of questions received by advocates and the outcome of the cases, and the correlation between the Solicitor General's involvement and the outcomes. Their research showed the significant rise of IP cases, especially in patent law, this decade, which had more than double the average number of IP cases per year than the average number in the preceding six decades dating back to 1950. Lee and Schwartz plan to publish their findings in an article in the Chicago-Kent Journal of Intellectual Property. For more information about SCIPR 2014, visit /scipr. "We were so thrilled to bring in a diverse group of scholars from around the globe to discuss important issues in innovation and creativity," remarked Professor Christopher Buccafusco, co-director of CESIP. "And we are grateful to the U.S. Patent and Trademark Office for co-sponsoring the event with us." This year's roundtable examined a variety of topics, including studies on architects and IP rights, the role and efficacy of patent examiners and supervisors in the Patent Office, patent forum shopping, IP litigation trends, and statutory sanctions. Professor Buccafusco and Professor David Schwartz founded CESIP in 2013, and the Center has quickly established itself as a leading forum for the rapidly developing field of empirical studies in IP law. 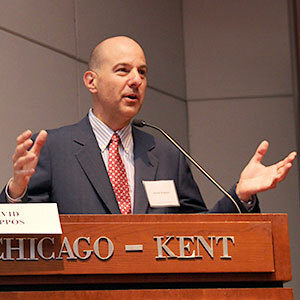 IIT Chicago-Kent's new BookIT IP Series kicked off with two engaging speakers. The new book talk series—the first of its kind in the United States—features authors of recent books on topics related to intellectual property, information technology, privacy, innovation, and the Internet. On September 8, Professor Jeremy de Beer of the University of Ottawa (pictured at immediate right) discussed his two groundbreaking new books Innovation & Intellectual Property: Collaborative Dynamics in Africa (Jeremy de Beer et al. eds.) and Knowledge & Innovation in Africa: Scenarios for the Future (with Shirin Elahi). Professor de Beer explained how he and a group of researchers were able to conduct empirical studies on how innovation and collaboration occur in a range of industries, including music, leather goods, textiles, cocoa, coffee, auto parts, traditional medicine, book publishing, biofuels and university research, in nine countries in Africa. The researchers are part of the Open AIR (African Innovation Research & Training) network that is conducting ongoing empirical research in Africa. 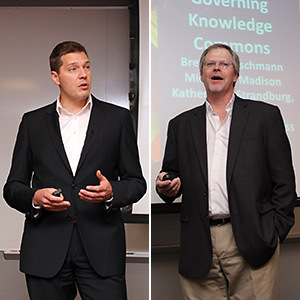 On October 2, Professor Michael Madison of the University of Pittsburgh School of Law (pictured above at far right) discussed his book Governing Knowledge Commons (B. Frischmann, M. Madison & K. Strandburg eds., Oxford 2014). According to the book, the "knowledge commons" is the "institutionalized community governance of the sharing and, in some cases, creation, of information, science, knowledge, data, and other types of intellectual and cultural resources." At the talk, Professor Madison explained how the book adapts the institutional analysis and development (IAD) framework developed by Nobel Prize winner Elinor Ostrom and applies it to study how people share knowledge in a variety of contexts. Two key findings of the research were that a knowledge commons often depends on shared infrastructure among people and that many different motivations underlie people's willingness to share. Three more authors will visit Chicago-Kent to discuss their thought-provoking scholarship and new books this academic year. All BookIT talks are free and open to the public. "The economic case for criminal sanctions is usually treated as unassailable. In this article, we mean to assail it. We do not believe that the case for criminal sanctions in IP is nearly as strong as many have treated it. Indeed, we will argue that criminal liability may be justified only in one small corner of IP law, in response to one discrete type of infringement." —from Christopher Buccafusco & Jonathan Masur, Innovation and Incarceration: An Economic Analysis of Criminal Intellectual Property Law, 87 Southern California Law Review 275 (2014).